Hey there pups! Just wanted to share this fun and cheeky pup play shirt now for sale at Mr S Leather. When you are out and about at the clubs or your local bar, sometimes it’s nice to flag your interest in human pup play without having be in the corner drinking from a bowl or wearing a pup hood. Having a few key pieces of pup play clothing can help spread the word of your interest. You just never know your next handler could be standing right next to you. 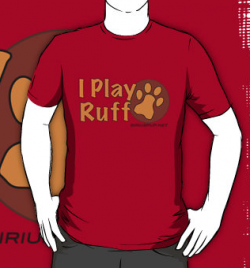 A pup play shirt can also be a great gift for a pup you love and care for. I really like this shirt as it’s bold yet shows a fun side to the person who’s wearing it. It also shows clear and proud that you are happy with your pup status and you are def ready to get down on all four right through to having a nice relaxing belly rub. You can check out this shirt here at Mr S Leather.